I'm still trying to tear through this little pile of records that were sent to me to review. 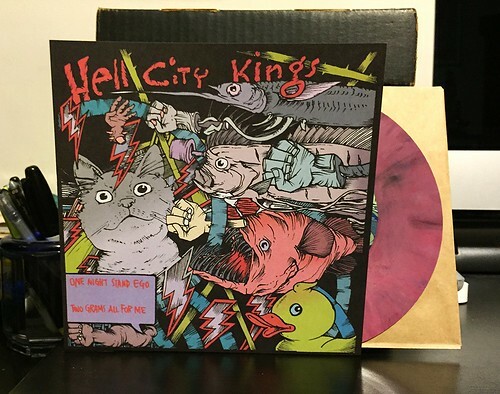 Next up on the list is a 7" from Hell City Kings. The artwork didn't make this seem like a particularly inviting 7" to throw on the turntable, but looks can be deceiving. I wouldn't go so far as to say I like this record, though it's not nearly as bad as some others that I've reviewed lately. Hell City Kings are very much your prototypical rock and roll band. More than anything I hear a big time Supersuckers influence. It's grimy, driving rock with lots of lead guitar licks and chord changes. The singer has something of a gruff wail that certainly suits the music, even if it doesn't really thrill me. I can't say that either of the 2 songs really stand out as they are both pretty similar. If you like your rock and roll or really like the Supersuckers but thing Eddie Spaghetti's voice is too finely tuned of an instrument, Hell City Kings may be just the band for you. If you think there's already plenty of this sort of thing out there, you can probably pass on this.